ROGERS PARK — Leaders at the city, state and federal levels met Thursday to discuss the state of the 49th Ward, including community safety, economic development, local schools and upcoming real estate projects. U.S. Rep. Jan Schakowsky (D-9th), state Sen. Heather Steans (D-Chicago), Cook County Commissioner Larry Suffredin and Ald. 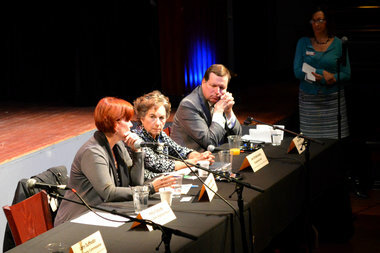 Joe Moore (49th) convened at Mayne Stage, 1328 W. Morse Ave., joined by members of the Rogers Park Business Alliance, the community and Loyola University to give updates on what's happening in Springfield and how it affects local business. Moore touted the revitalization of economic hubs in the neighborhood like Morse Avenue, saying it was due to an abundance of local, family-owned businesses (as well as small, regional chains) that the community was experiencing "explosive growth." Still, a decrease in the neighborhood's population and safety problems are keeping the area from fully thriving, he said. Moore listed several new and upcoming businesses and said it was essential to draw people to his ward in order to keep the upward swing. "The dollars you spend at these businesses is money that stays in the community," Moore said. "Rogers Park is where the action is, right here." Summur Roberts, president of the business alliance's board of directors and director of community relations at Loyola, opened the meeting by emphasizing the importance of art-oriented developments in the community, specifically a potential partnership with non-profit real estate developer Artspace. Suffredin called Rogers Park "one of the jewels in Chicago's crown" before launching into a discussion of recent property tax increases and calling for increased regional economic planning in order to keep from pricing businesses and developers out of the city. Schakowsky called the state budget situation "dysfunctional" and said the predominant theory of trickle-down economics has kept potential customers from having expendable income to spend at local businesses. Steans also talked state budget politics, calling the current impasse "not rocket science" and "entirely solvable," and claimed Gov. Bruce Rauner was holding the budget hostage.